When lake levels rise due to heavy spring rains high water will most likely be the norm for a few weeks in our tailwaters. High waters in both the North Fork and the White River have lasted as long as several months. The only serious threat to good fishing during high water is the mistaken belief that you cannot successfully fish a strong current! The good news is you can catch fish and a lot of them. High water conditions will be very frustrating for flyfishers who prefer to wade. 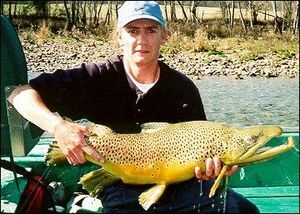 If you choose not to fish because you can't wade, you will be missing out on some truly exciting fishing. I have heard many say, "if I can't wade, I won't fish", and this thought may leave them spending many precious hours behind the vise. As a full-time fishing guide, I can't give up when the water rises so I've learned a few tricks to catching nice fish in a powerful. High water conditions will produce fish when using proper techniques. Knowledge of fish holding areas in these water conditions is key to your success. A good boat driver is imperative. Fly fishing from a boat when conditions are inadequate for wading is something I have enjoyed and been productive at for many years. Strategies change but the fishing is just as exciting. You must be able to keep the boat pointed upstream and drifting at the speed of the river current. Those who choose to try the high waters will need to learn a few new techniques. Fish areas that you think hold fish and are shallow enough to get a fly close to the bottom. Gravel bars and grass beds which are normally exposed during low water are a good start. These areas provide plenty of food and many are full of depressions for fish to hold out of the stresses of the main current. High water fishing will also change your fly selection. One of my favorites for high water is a bright red San Juan worm with a hare's ear or caddis emerger as a dropper. Larger indicators to support the heavy weight needed to get these flies down are necessary. For this reason, marabou jigs are also a great choice. Depending on the speed of the current and depth of the water, you will have to experiment a little to achieve the proper weight.